San Antonio Skyline Twilight - San Antonio Skyline twilight image we took from a good distance from the downtown. We try and take different angles of the city so you can find the perfect view. 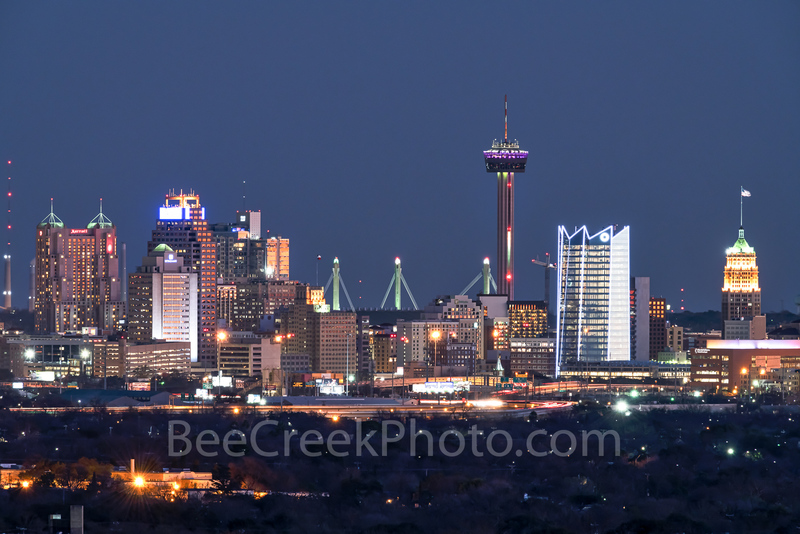 This San Antonio skyline has the new Frost Tower along with all the other city landmarks like the tallest building Tower of Americas, the Life tower, the marriott, and the many building with the colorful lights on them. San Antonio is the second most populated city in Texas it is located in central texas on the edge of the hill country. Many tourist come here to visit the Alamo, or to visit the lively riverwalk not to mention the mission park through out the city. Photo © copyright by Bee Creek Photography - Tod Grubbs / Cynthia Hestand.